This delicious steak recipe is quick and really easy to make. It is a great weeknight meal or even suitable for when you have guests over. The best part about it is that it is a very healthy and balanced meal. 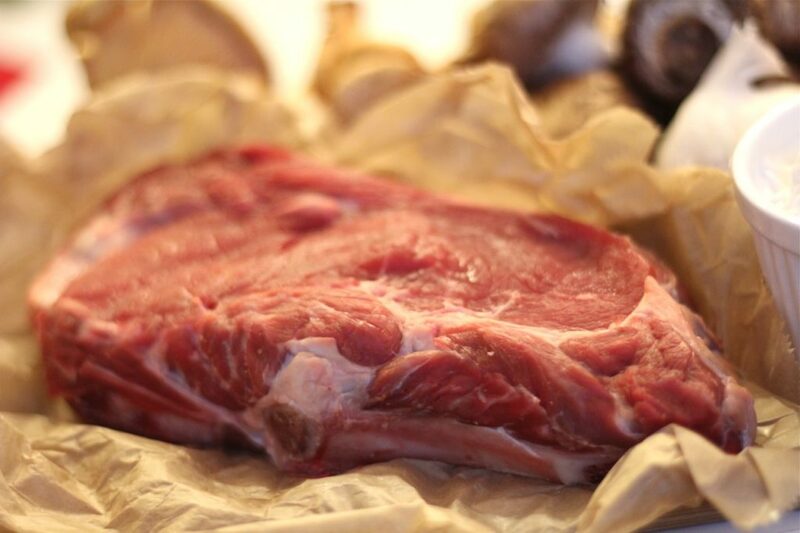 When you buy your steak make sure it is 100 % grass-fed. An alternative is to look for grass-fed and grass-finished. Otherwise you cannot be sure that the cows haven’t been fed GMO corn to speed up the process. Since the food industry is doing tricky things when it comes to labeling it is important to be informed to make sure you can make the best decisions for you and your family. Yes, responsibly raised meat is a lot more expensive than what we are currently used to. But it is an important investment in your health. A huge plus is that it tastes better too. However the total cost of your meal actually doesn’t have to be more expensive. In the picture above you might notice that the steak isn’t dominating the whole plate. Aim to approximately fill 3/4 of the plate with vegetables and the rest with meat. Of course this is an individual choice depending on your specific dietary needs. This recipe will approximately take 20 minutes to make, depending on how thick you slice your sweet potato wedges. When preparing the sweet potato I recommend to use a sharp quality knife. If you don’t have one it is so worth investing in a good knife. It will make your cooking experience so much quicker and more pleasant. To spice up the sweet potato wedges even more, add some fresh minced garlic to them or your favorite spices and herbs. If you don’t like sweet potatoes you can try regular potatoes instead. I hope you love this recipe as much as I do. If you would like more simple recipe like this one make sure to download my free e-book. This delicious quick dinner recipe is great for a quick weeknights dinner. 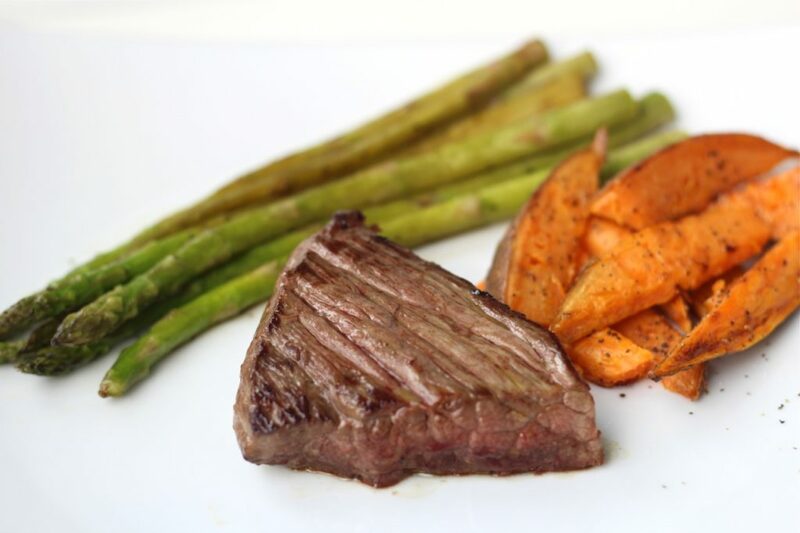 Featuring steak, sweet potatoes and asparagus makes for a balanced healthy meal. Preheat the oven to 400 degrees. Wash and cut the sweet potato into thin wedges. Drizzle olive oil on a baking sheet and add the sweet potato wedges. Add salt and pepper and roast for 10 minutes. Turn the sweet potatoes and roast for another 10 minutes or until cooked through yet crispy. Baking time can vary depending on how thick you cut your wedges. While the sweet potatoes are baking wash and dry the asparagus and trim the ends. Heat a large pan over medium heat. Once hot add avocado oil to coat the pan. Sauté asparagus for about 2 minutes or until browned and then reduce heat to medium/low. Cook for another 3 minutes or until tender. Season with salt and pepper. You might have to do this in batches if you use a lot of asparagus. While the asparagus is sautéing heat a small pan over medium heat and season the meat with salt and pepper on both sides. Once the pan is hot add the avocado oil to coat it. Cook the meat for about 3 minutes each side for medium. Increase or decrease cooking time to your liking or depending on how big your cut is. Serve the meat with asparagus and sweet potatoes. Double up the portion and have a meal ready to warm up for lunch or dinner the next day.